Right, so, yesterday was Bastille Day and even though I’m late posting these pictures, you can rest assured that I did in fact dress up specifically for the occasion in tricolor (and a couple of my favorite French accessories). 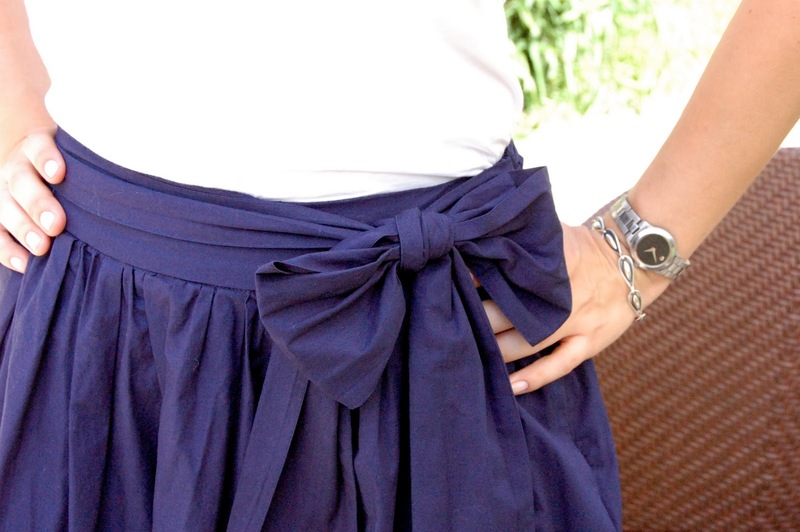 The big deal in this outfit is obviously the skirt, and the big deal in the skirt is obviously the bow, of which I am inordinately proud (and probably not ever going to untie because I don’t think I could do it as well again). I would also like you to know that I probably spent as much or more time ironing this skirt as I spent actually wearing it. It is also possible that my inexperience ironing exceeded the actual difficulty of the task (don’t worry Dad ~ I took the plastic off the board first). 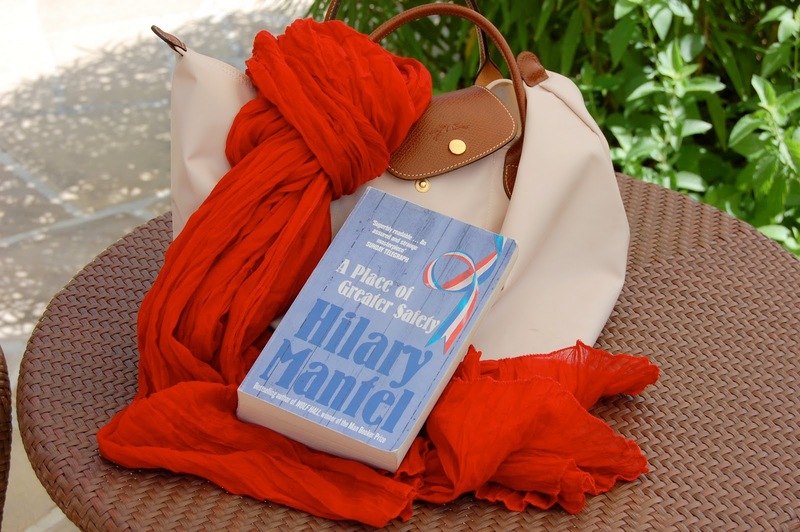 Now, I know I’ve gone a little bit overboard with the bag-on-table pictures lately (two is overboard as far as I’m concerned) but I wanted to explicitly highlight the incredible book I’m reading, A Place of Greater Safety by Hilary Mantel. It’s a novel of the French Revolution told through the friendships of Camille Desmoulins, Georges-Jacques Danton and Maximilien Robespierre and it is very, very good. I started reading it just before we left London after having searched high and low for it on the Waterstone’s 3-for-2 tables. Seriously, we went to at least three Waterstone’s locations before finding a single copy on special at the LSE location, which happens to have the tiniest fiction section ever. (We also experienced our first-ever difficulty choosing a third book on that trip and ended up going with another pocket-size Moleskine just so we could get gone. This has never happened before, nor will it every happen again.) My obsession stemmed from just having finished her book Wolf Hall (also picked up on 3-for-2 by P the Camden outpost en route to a hair cut) which won the 2009 Man Booker prize and was so intensely intoxicating that I could not put it down ~ the best historical fiction I’ve read in ages. Tudor England and revolutionary France (respectively) are two eras that I haven’t studied in any particular detail, but these novels have so piqued my interest that I’m paralleling them with Jenny Uglow’s A Gambling Man (yeah, okay, it’s Restoration but still Cromwells so I’m counting it) and Simon Schama’s Citizens (of which we have, like, a zillion copies, for whatever reason). If you’re into history, or books, or both, I highly recommend all of the above. Besides, it’s summer ~ what else are you going to do? This entry was posted in Books, Hers, Outfits and tagged chanel, coach, hilary mantel, james avery, jenny uglow, loft, longchamp, moleskine, movado, simon schama, target, vintage, waterstone's. Bookmark the permalink. Hard to believe the scarf is from Target – looks lovely. I tried to get into Wolf Hall but I have to admit that I put it down – just couldn't get into the story (although I'm generally into historical fiction). Or, rather, I couldn't get into Mantel's style. Have you read David Liss? Am in the middle of David Mitchell's newest which, sadly, isn't (yet) approaching the genius of Cloud Atlas. Your look is effortlessly chic. You look very comfortable and put together. How did you ever master such an epic bow!? what else am i going to do?well, READ BLOGS OF COURSE!! !i adore the skirt. AND the bow. and is that bag all it's cracked up to be? it seems like EVERYONE in nyc has one.